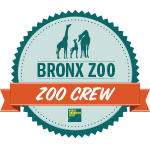 If you've got a kid remotely interested in dinosaurs or animals or live shows, then I've got a treat for you! 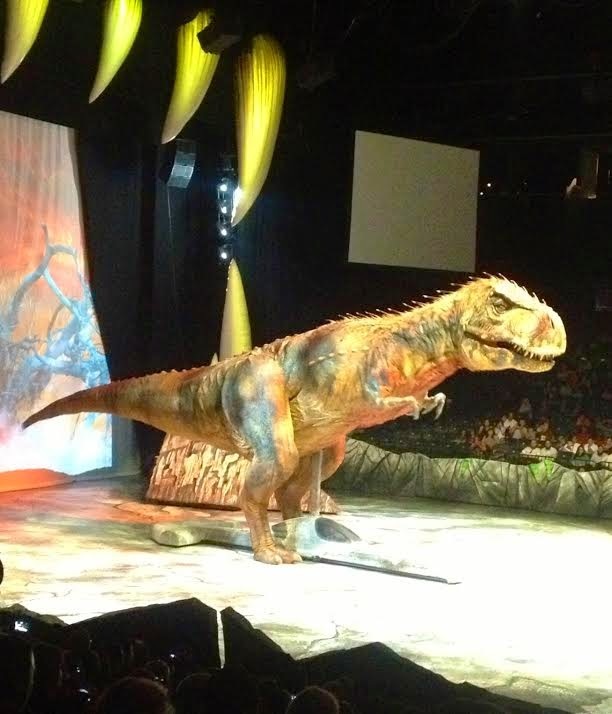 This week, Aiden and I attended Walking with Dinosaurs -- The Arena Spectacular at Barclays Center, a show that's thrilling, entertaining, and educational. I've said this many times on this place and space, Aiden is a huge fan of dinosaurs (particularly Stegosaurus, Allosaurus, and the amazing T-Rex), and to be able to see the show on opening night was extra special! 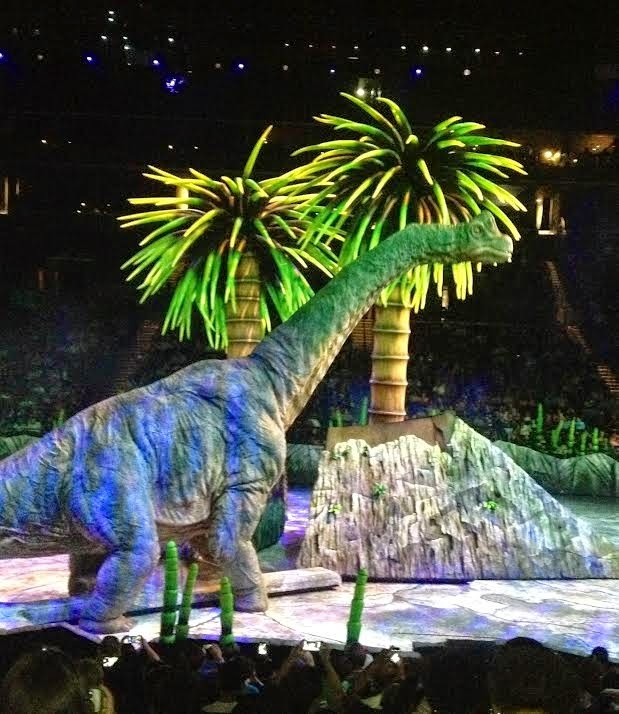 The show travels back in time to 65 million years ago when dinosaurs ruled the land. 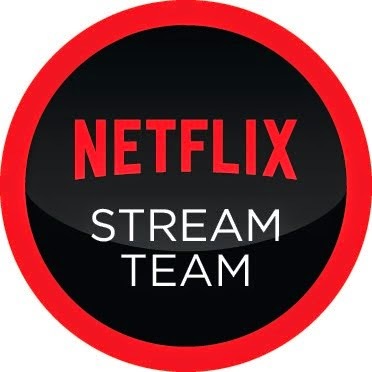 While it is the narrator who takes us through the Cretaceous Period, Jurassic Period, and the Triassic Period, explaining phenomenons and interesting facts about the dinosaurs, it is the dinosaurs themselves that are the main attractions. We hear them roar, we see them defend their young, and we watch as they fight for survival. While all of this is taking place, the lighting and special effects adds to the drama of the entire production. Needless to say, there will be times where your child will be sitting at the edge of their seat, holding their breath, and wondering what will happen next. Oh, and please believe that this behavior is not just limited to the kids at the show. I may or may not have jumped a few times during battles. 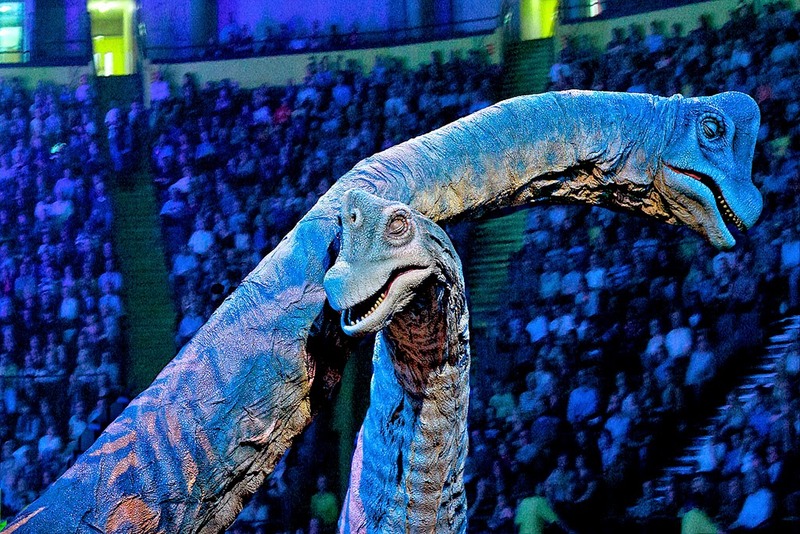 Throughout the show, the audience will also have the chance to see the immense amount of love that parent dinosaurs have for their offsprings and the incredible bond between them. 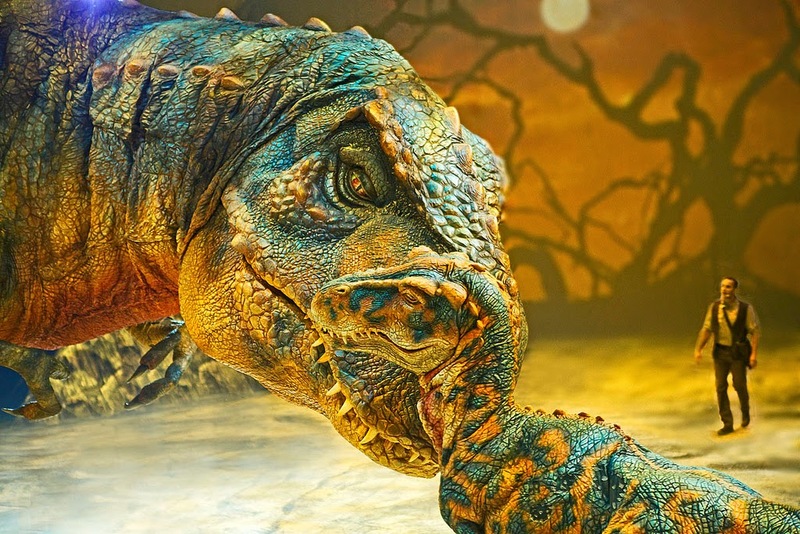 We get caught up and wrapped up in the Mama T-Rex being fierce and strong while protecting her young, but sweet and tender when nurturing her baby. It's a most delicate moment in the show and also one of the sweetest moments. That being said, if you have a toddler who scares easily, you may want to get a seat that's further up in the arena. Aiden and I had seats that were practically thisclose to the front row, which was perfect for a dinosaur lover like Aiden. But I can certainly see how a smaller child would have been scared of the life-sized creatures, battles, and/or special effects. 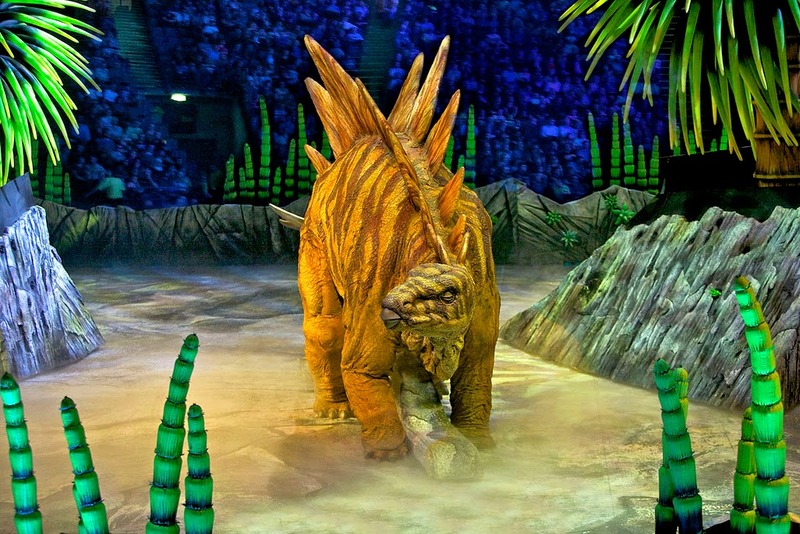 Walking With Dinosaurs -- The Arena Spectacular runs from now until July 20th at Brooklyn's Barclays Center. 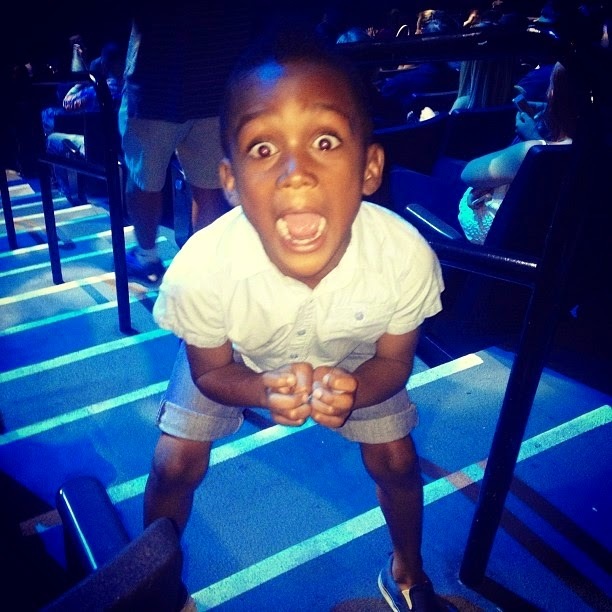 The show is fun for the entire family and the perfect memory-making experience. Visit the website for more information or to purchase your tickets. That looks like a fun place.